PVC free polyurethane coated fabrics are better for the environment, safer for human health and longer lasting. 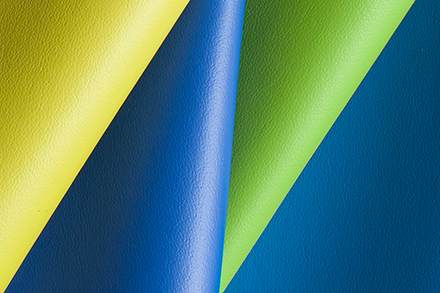 Momentum Textiles polyurethane fabrics offer PVC free choices for the specifier, including 29 patterns in 588 color options as well as solids, textures, embossing and interesting patterning that work well in any environment. 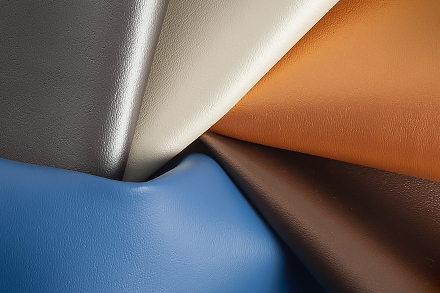 Polyurethane fabrics are PVC free, no phthalates, no heavy metal, have low VOC’s and are Greenguard Certified. Momentum Textiles polyurethane fabrics have a soft hand, upholster easily and are cleanable with 27 approved cleaners including bleach. Momentum Textiles' latest polyurethane fabric is created utilizing a new superior molecular structure that yields reduced environmental impact and increased performance. Blending geometric and organic, a classic quatrefoil shape is sprinkled like clover over a tailored chambray ground. Everywhere EPU, designed by Sina Pearson, is a smooth surface polyurethane designed for use indoors and outside. Interlocking curves layer to create a gentle movement in this large scale, multi-colored geometric design. This printed design offers dimension and movement with layered lines that weave across the surface. 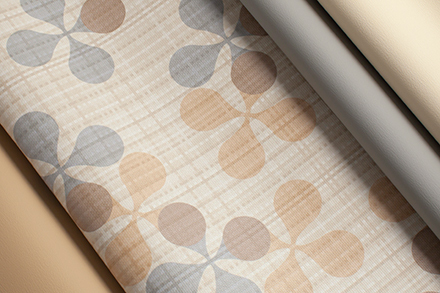 A subtle texture and a soft hand, this pattern is offered in a broad range of hues. Inspired by the work of Swedish architect Sven Markelius Archer offers a printed mid-century appeal. 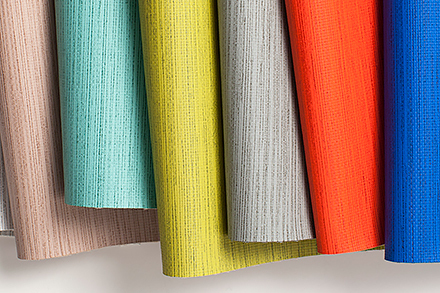 Mimicking the look of a refined woven textile, Beeline offers a functional solution that coordinates easily. A beautiful leather-like look and feel that adds a rich aesthetic to any upholstered piece. 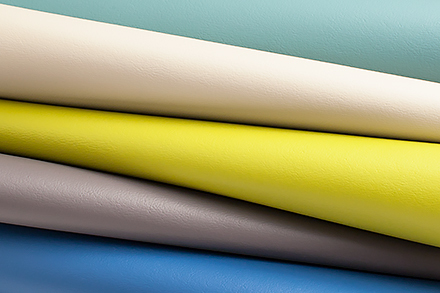 This solid leather-like polyurethane pattern offers a wide range of vibrant and exciting colors. 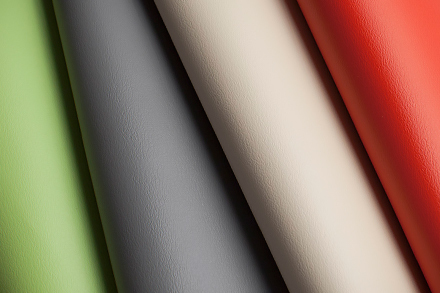 This solid polyurethane design features an irregular leather-like grain and is offered in a broad range of hues. Cycle features an embossed pattern of overlapping circular linework in an allover layout with a metallic look. This whimsical, contemporary design is set atop a subtle sheen of highlights, lowlights and metallic pigments. Color paired with an embossed texture creates a modern, metal-like surface with shifting light and intense dimension. 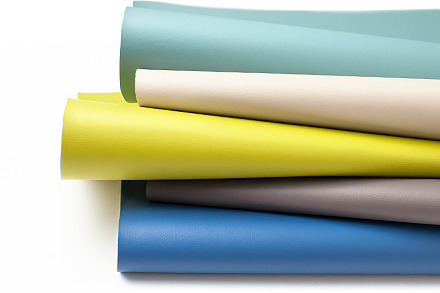 Foray offers a refined leather-like surface grain and a smooth, soft hand in a broad range of hues. Designed to play with light, Fringe’s pattern of bending lines appear and disappear from various points of view. Groove features a printed pattern of textural linework so finely articulated that it becomes a subtle wash of texture. An upbeat pattern designed to delight with its simple geometry of circles and lines in fresh, pure colors. Defined by a network of embossed hexagons, Hive offers classic appeal offset by a high tech aesthetic. Sleek, minimal and modern, Icon tantalizes the senses with a smooth hand and striking metallic-glazed surface quality. A beautiful and fluid linework pattern that marries technology and performance with an organic aesthetic. Inspired by classic ikat patterns, Leno modernizes this timeless style in a dynamic and dimensional manner. Nifty pairs a cross-hatch texture with bold, saturated color creating an aesthetic that is classically modern. A leather-like look with a rugged surface quality, mimicking a slightly irregular leather grain with a natural patina. A linework pattern that is carefully printed on top of an embossed texture allowing for a unique look. A traditional ogee shape, Sidestep makes this element of design feel modern using dots to create the pattern. This pattern features an embossed pinstripe design in metallic hues for an ultra-modern look. 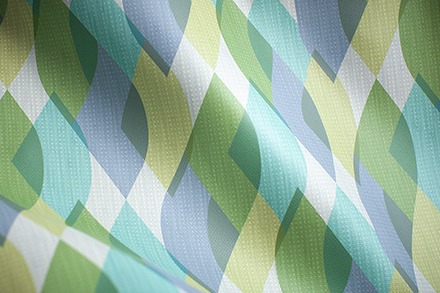 A simulated stitching effect creates a rhythmic backdrop to the multicolor design of small rectangles. Tetra offers a unique, micro-geometric design and a radiant, polished surface in a full spectrum of hues. A printed pattern offering an exceptionally smooth, pliable hand with an ultra-modern matte appearance. The most recent addtion to the Endurance EPU™ family of products, Whit EPU is a textured plain with a woven look. Small in scale, delicate in execution but striking in presence, Zipped is an elegant patterned plain.